This compact, combination Reverse Osmosis plus Type II DI System is for operation on virtually any quality tap water, containing up to 1,000 PPM of TDS (total dissolved solids). The 10-LPH reverse osmosis portion of this system reduces operating costs by economically removing ~95% of the contaminants from the incoming tap water. The Type II DI portion of this system produces 2-15 Megohm-cm water at a flow rate of 4-5 Liters/minute and will provide DI water to a glassware washer via the storage tank at up to 20-Liters/Minute.DI water is continuously recirculated to maintain water purity and reduce the risk of bacterial contamination. The system has a 1-year warranty, is made in the USA, and can be bench, shelf or wall mounted. This system includes a 42-Liter pressurized tank for storing the DI purified water that is used by the glassware washer. The systems price includes two purification modules: one installed and one spare. 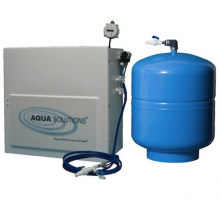 Continuos recirculation is utilized to ensure water quality and prevent the growth of microorganisms within the system. Certified by CSA for the US & Canada, CEmarked for export for EU countries. Built in Reverse Osmosis pretreatment lowers operating cost by economically removing 95-98% of the contaminants from the tap water. Recirculation Continous recirculation is utilized to ensure water quality and prevent the growth of microorganisms within the system. Purity Sensor Includes LDC readout conductivity monitor with adjustable setpoint and flashing red LED alarm.